Ray Harryhausen passed away today. If you don’t know that name, he was a filmmaker who pioneered the use of stop-action animation and made some of the greatest monster flicks ever seen. His SINBAD movies and JASON & THE ARGONAUTS inspired me to build Lego monsters and create my own stories at a very early age. And, of course, his CLASH OF THE TITANS from 1981 stands alone as a classic piece of special effects awesomeness. I watched his movies over and over. As a kid who loved creatures and monsters, there was none higher than Harryhausen. Without a doubt, you wouldn’t have seen the creatures of the INFECTED series without him, nor would you have probably seen the well-developed and truly alien species of the GFL series. He set my imagination aflame. The first story I ever wrote, “Tentacles, Tentacles and More Tentacles,” was, in my young mind, a Harryhausen monster begging to be brought to life. It hits hard when heroes die. I raise a glass to one of the greatest entertainers of all time. Oh geez, I remember reading about him when I was a kid. He was truly revolutionary, and am saddened by his passing. The world truely lost a Master today. RIP, Ray. sad day, clash of the titans has been one of my favorite movies since seeing it as a child. RIP Ray Harryhausen. 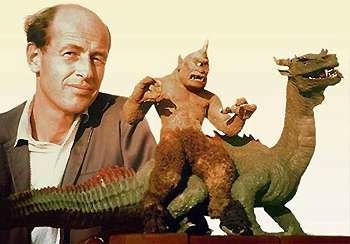 RIP Ray Harryhausen. I remember watching Jason and the Argonauts on TV one Saturday afternoon back during the Johnson administration. The scene where Jason threw the teeth on the ground that became fighting skeletons still stays with me!